19th-ranked Oregon claimed its first-ever sweep of 21st-ranked UCLA in Los Angeles, Calif., and the first overall since 2014 to get back on track this week. 2nd-ranked Stanford kept its perfect Pac-12 start going with a 4-set win over Utah, which received votes this week. After falling in back-to-back matches last week, 19th-ranked Oregon handled 21st-ranked UCLA in straight sets in the road Friday night. 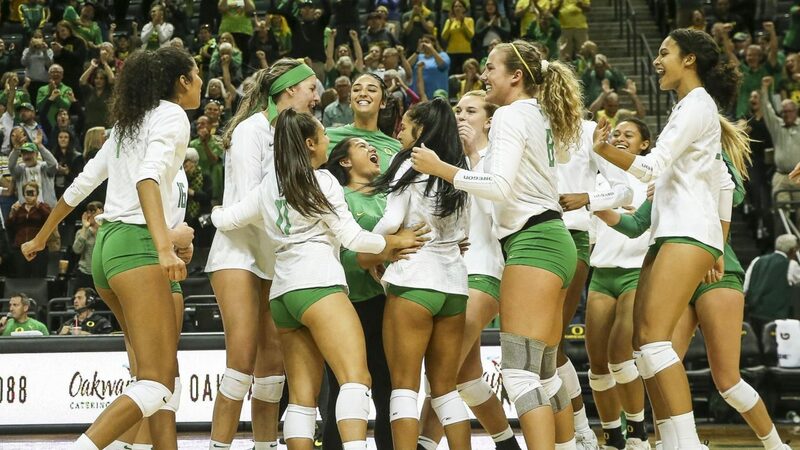 It is the first time the Ducks have swept the Bruins since 2014 and the first-ever 3-0 win in Los Angeles, Calif.
Oregon was dominant in the match, outperforming UCLA in almost every statistical category, including attack percentage (.231 to .145), blocks (12 to 5) and service aces (5 to 0). Taylor Borup, who earned her first Pac-12 start, led the Ducks with a 13-kill, 16-dig performance. 2nd-ranked Stanford earned a hard-fought 4-set victory at RV Utah on the road in Salt Lake City, Utah. The Cardinal used a .224 attack percentage, 13 to 11 blocking advantage and 7 to 4 serving edge to remain undefeated in Pac-12 play. 1️⃣1️⃣ straight wins for @StanfordWVB. 14th-ranked Washington overcame 18th-ranked Arizona in straight sets with a season-best .333 attack percentage and dominant 9 to 1 blocking advantage. The Huskies, who are on a 7-match win streak, have won each of the last 14 meetings against the Wildcats. Arizona was down a starter, as Paige Whipple missed the match with a concussion. After dropping 3 conference matches in a row, 24th-ranked Colorado got back on track with a hard-fought, 5-set win against California. Though they trailed in blocks (12 to 11) and service aces (5 to 4), the Buffaloes outperformed the Golden Bears in attack percentage (.200 to .149) to secure the final result. 20th-ranked Washington State won its 3rd-straight Pac-12 matchup Friday, sweeping past RV Arizona State. The Cougars were dominant in every way, besting the Sun Devils in attack percentage (.278 to .155), blocks (7 to 5) and service aces (9 to 1). Saturday, Oct. 6 Oregon State at UCLA Los Angeles, Calif. 10 p.m.
Sunday, Oct. 7 Stanford at Colorado Boulder, Colo. 2 p.m.
Washington State at Arizona Tucson, Ariz. 3 p.m.
Washington at Arizona State Tempe, Ariz. 3 p.m.
California at Utah Salt Lake City, Utah 4 p.m.
Oregon at USC Los Angeles, Calif. 4 p.m.